Innovation is at the core of each MACSQuant Instrument, offering automated flow cytometry solutions for a diverse array of appliations. With three lasers and up to sixteen optical channels, multiparametric flow cytometry assays can be performed for a wide range of sophisticated phenotypic analyses and functional studies, such as rare cell analysis, toxicological assays and proliferation studies on a variety of sample types, including whole blood, cell lines, exosomes and yeast cells. In addition, the extremely small foot-print design with integrated computer and monitor, makes all our flow cytometers real benchtop instruments. MACSQuant Flow Cytometers have been designed to automate and optimize routine housekeeping procedures such as cleaning cycles, startup, and shutdown. With automatic clean and shutdown programs available on the MACSQuant Analyzer, there is no need to stand-by until your experiment is finished. MACSQuant Calibration Beads are specially developed for automated optimization of channel voltage settings to ensure consistently high performance. Single-stained cells or compensation beads can be used for fully automated compensation. The automated calibration feature of the MACSQuant Analyzer saves time, is simple to operate, and ensures optimal and consistent instrument performance. Benefit from a complete automated solution for sample processing: from sample labeling and uptake, to data acquisition and analysis, up to 384 samples can be processed in a single run. Labeling proceeds completely automated using optimized incubation times and titers (e.g. PI, 7AAD, and antibody staining). The entire process is streamlined to deliver walk-away flow cytometric analysis. In addition, all MACSQuant Analyzers are capable of intergrating into a versatile array of lab robotics and liquid handling systems for around-the-clock processing and in-lab automation workflows. 1. Scan reagents using the barcode reader. The MACSQuantify™ Software automatically identifies the correct staining protocols to minimize operator error. 2. Place reagents and samples onto the MACS MiniSampler. Samples are kept cool by MACS Chill Racks, thereby maintaining specimen integrity. 3. Instruct the MACSQuantify Software to perform the desired analysis and press 'Start'. The MACSQuant Analyzer facilitates analysis of up tp 96 samples in a single run; ideally suited for large-scale assays and high-throughput screening. An integrated MACS Column enables rapid pre-enrichment of rare cells prior to flow analysis on the MACSQuant Analyzer 10, MACSQuant Analyzer 16 and MACSQuant VYB. The entire procedure is accomplished in just a few simple steps, helping you to save time without compromising on the quality and sensitivity of your rare cell analyses. MACS MicroBead Technology has become the standard method for cell separation. More than 18,000 publications have proven its versatility: cell separations with consistent high-quality results from lab bench to clinical applications, from small to large scale, from frequently occurring cells to rare cells and sophisticated subsets. All of our MACSQuant Flow Cytometers have an auto-labeling function that drastically reduces the amount of time you have to spend pipetting. Simply scan reagents using the barcode reader. The MACSQuantify Software automatically identifies the correct staining protocols and minimizes user error. The auto-labeling feature of the MACSQuant Analyzer eliminates the time-consuming step of manual cell staining, streamlines your flow cytometry analysis, and provides higher accuracy. Speed: absolute cell counts in real time with the completion of your sample. Cost-effectiveness: no need for expensive counting beads or particles. Ease of use: results at the touch of the button. The counting operation is integrated into each and every automated cell analysis. It is often necessary to know the exact number of cells in a sample for downstream applications. For ease of use, the MACSQuant Analyzer quickly performs absolute cell counting without the need for counting beads or cell staining. Download the brochure to find out more about our MACSQuant Flow Cytometry solutions. Download the brochure to find out more about the MACSQuant X Flow Cytometer. 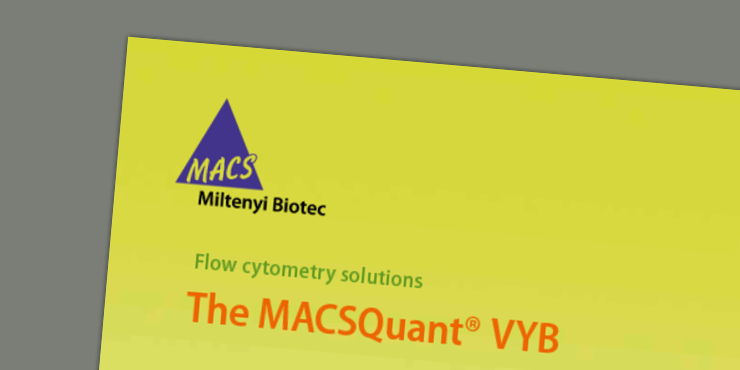 Download the brochure to find out more about the MACSQuant VYB Flow Cytometer.